Fried Chicken and Waffles?!! Yes, it’s a weird combination, but it works! I had a major fried chicken craving and didn’t feel like making it at home. I wanted real fried chicken. I did some research of the best fried chicken restaurants in Los Angeles. After many reviews, I found Roscoes House of Chicken and Waffles in Hollywood. They’re popular for their fried chicken and waffles. To beat the huge crowd that’s always there, my husband and I woke up at 8am to go eat fried chicken. We ordered Sunset which is a fruit punch/lemonade combo. The drink was refreshing. I ordered the #13 Carol C. Special which comes with a huge chicken breast and a waffle. The chicken was perfectly crispy on the outside and super juicy on the inside. I think it was the best fried chicken I ever had! The fried chicken went really well with the waffle. Syrupy goodness with hot sauce, yum. Oh, I also ordered a side of mac & cheese to clog my arteries even further. It was also yummy! 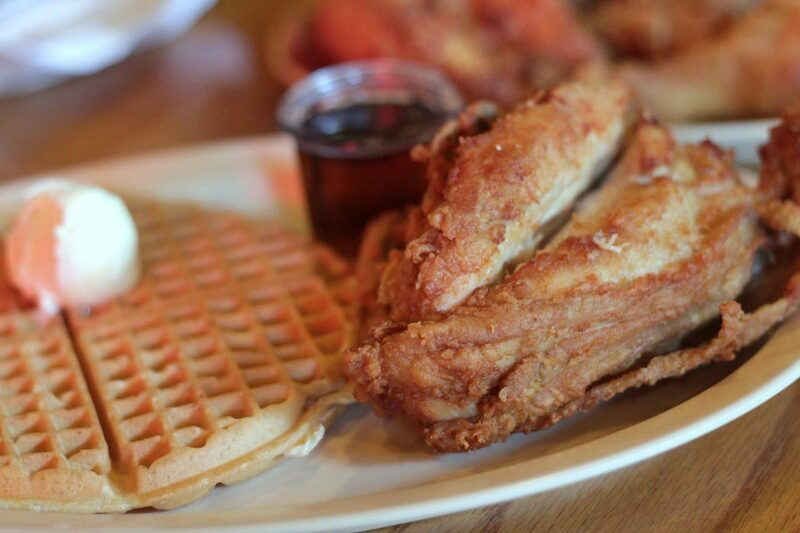 If you’re in town and craving fried chicken, check out Roscoes House of Chicken and Waffles in Hollywood. Parking is limited so show up early if you can. Oh! and you might even see a celebrity or two.